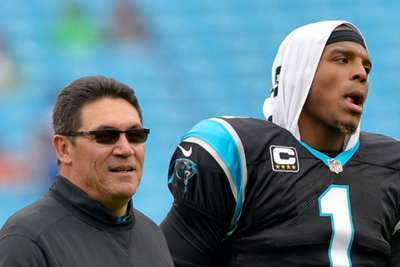 Carolina Panthers coach Ron Rivera is not yet ready to make a decision on Cam Newton's role in the final weeks of the regular season. The Panthers slipped to a sixth straight defeat on Monday, losing 12-9 to the New Orleans Saints, as quarterback Newton struggled amid a continued shoulder issue. Newton completed just 55 per cent of his passes for 131 yards with no touchdowns and an interception. Over the past three weeks, the 29-year-old has thrown six interceptions to three touchdowns and rushed for fewer than 35 yards in each game. It had subsequently been suggested that Newton might have played his last down of the year and would be left out of season-closing meetings with the Atlanta Falcons and the Saints. But Rivera confirmed that he will continue to stand by Newton, although discussions with the player and with medical staff were set for later on Tuesday. "We'll wait until we have a conversation [with the doctors and Newton] and see where we are," Rivera told a news conference. He added: "I believe in Cam, so we'll leave it at that." And Rivera pointed out that the Panthers, although now 6-8, still have an outside chance of making the playoffs and so cannot commit to sitting a key man. "There's still a slim glimmer, so we'll see," he said. "We'll continue to focus on playing football. We've got Atlanta coming to town and, for all intents and purposes, we play to win." Newton was asked after Monday's game whether he might be absent against the Falcons and replied: "That's not on me. "My job is to do the things that I can control and, for me, at this particular point in time, I don't have an answer for you."